I’m so excited to share this craft with you today! We’re starting to get a little excited about the Olympics over here. We aren’t a big sports family, but RD Husband has one sister who was an athlete in the Olympics in 1988 and another who has coached Olympic teams. So we have a soft spot for the games. 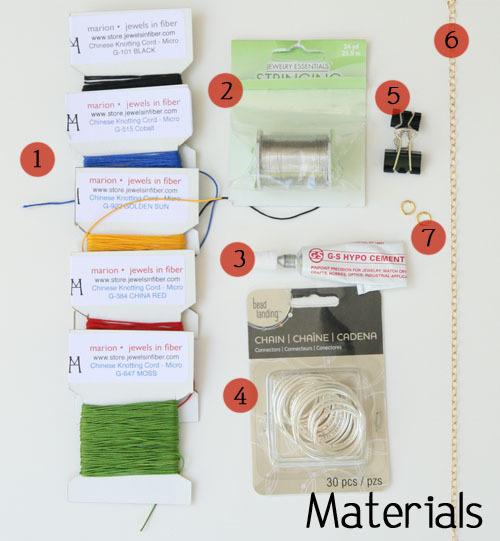 This necklace is easy and inexpensive to make. Here’s what you’ll need. Cord in 5 different colors: red, green, yellow, blue, and black. I used Chinese knotting cord in micro size G, which I ordered from here. 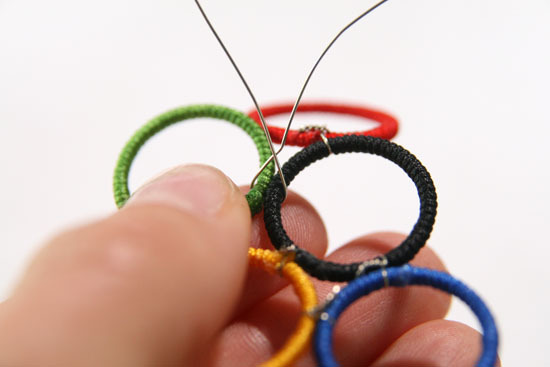 You could also use crochet thread, embroidery thread, or embroidery floss, all of which are readily available at craft stores. G-S Hypo Cement, or another strong jewelry-type glue. Michaels carries Aleene’s or E-6000, which both should work. 5 rings (I actually bought a cheap Claire’s Accessories necklace and took it apart, but you can find these at Michaels in different sizes, too). Chain in desired length. I used about 17″, divided into two lengths of 8.5″. You could get something simple and inexpensive like this, or check out a jewelry supplier like Rio Grande or Fire Mountain Gems. Most, if not all, of these things can be found at Michaels or JoAnn Fabric. First step is covering your rings in the cord. 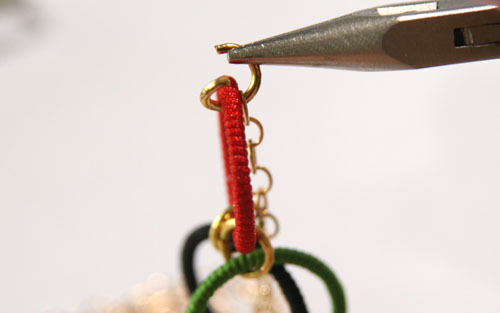 You want to attach the cord with glue at the beginning, wrapping it a few times around. 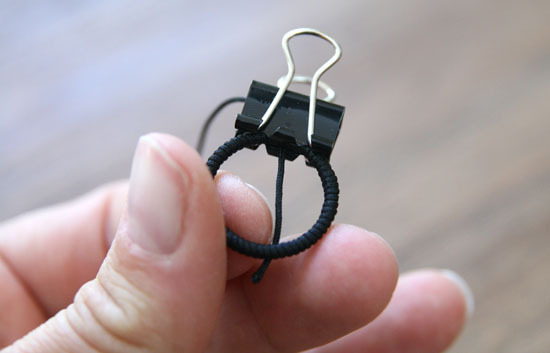 Secure it by clipping a small binder clip over it and let it dry for about 15 minutes. You can prep all your rings this way, and by the time you are done with the last one, the first one should be dry enough to work with. Now, wrap the cord around the ring, keeping it tight and each coil snug against the previous one. You don’t want to see any metal through the wrapping. In order to keep the right tension, you’ll need to hold the parts you’ve already wrapped tightly while you wrap more. Stop wrapping with about a quarter of an inch or so left to go. Now, place more jewelry glue on the exposed metal, and then continue wrapping until you have covered the ring. Don’t worry about the long ends of the cord just yet. Secure this section with your binder clip and let it dry. 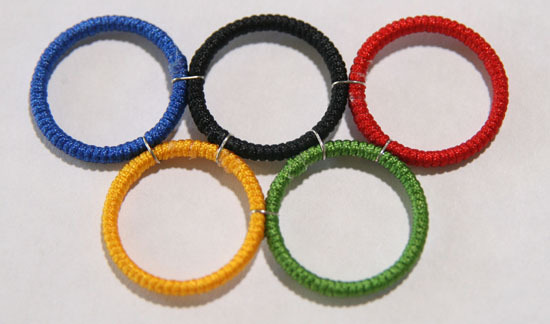 You’ll do this for each ring in each different color cord. 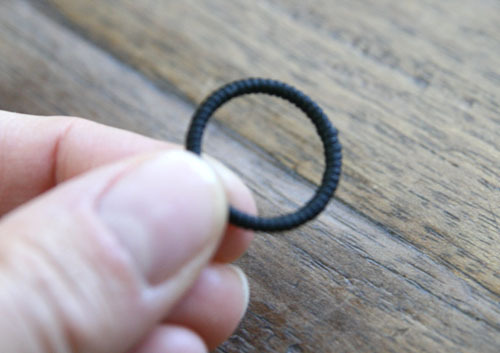 Once they’ve dried (I let mine sit overnight just to be certain), you can clip the cords close to the ring. I chose a side I wanted to be the “back” and clipped them both on that side, so the edges wouldn’t show. Although if you’ve glued enough, the edges will sort of blend together with the ring. Once you have all your rings, it’s time to lay them out in the correct pattern. Check online and look at images to get your order correct. Then, you are going to start wiring them together. 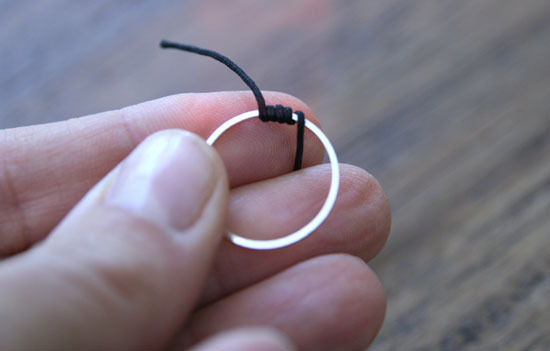 Cut a small length of wire, about 3″ long, and place it over one of the connections between rings. Turn to the back, and twist the two wires together, like twist ties. You can use your fingers, or if you have needle nose pliers, those work well, too. 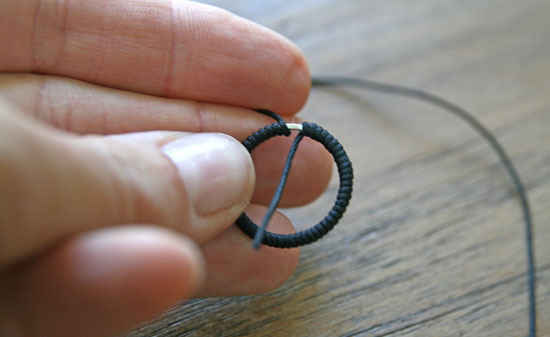 You’ll twist until the connected wires are about 1/4″ long, and then snip the wires off. 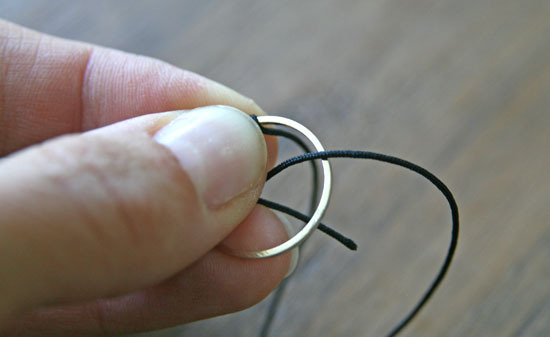 Fold them under and towards the rings so that they don’t stick out, but keep them hidden in the back. Make sure you are wiring them tightly together so that they keep their shape. Then, you just need to attach the chain with the jump rings to the blue and red circles. Attach your clasp, and your necklace is done! Now you’re ready to watch rhythmic gymnastics! Hope you enjoy! This is so cute! 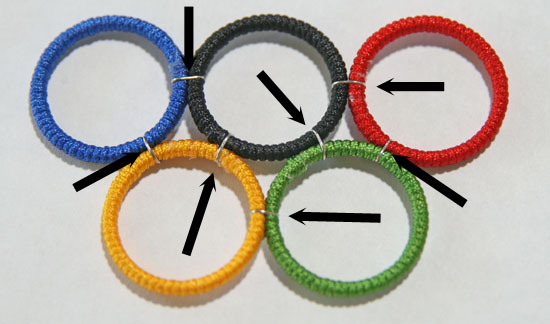 I could also see wrapping a bunch of rings in multiple shades of the same hue, or perhaps all one color (though any grouping done in this configuration will, regardless of color, probably look Olympic-y). And how cool that RD hubs has such close ties to the games! Right on! So cool! I love the way it hangs on the chain! Thanks for sharing. super cute! but not cute enough for me to scream at what i know would cause hours of frustration because i don’t have near enough patience or digital dexterity to make this happen. this is my first visit here and i see you have an etsy shop. will you be selling these there? Yes, I think I will put a few up in the shop & see what happens! Thanks for visiting! Visiting from Craft Gossip, so happy to find your site! 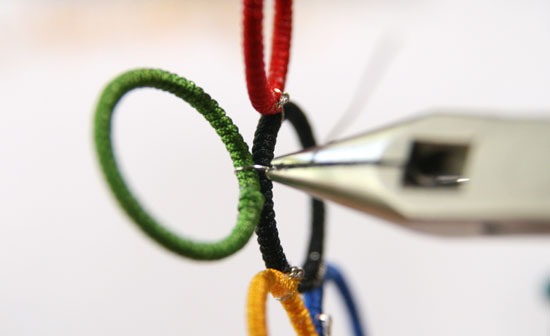 I love this Olympic necklace you created, thanks for the step-by-step instructions! Thanks so much for stopping by, Dani! Really cool, I love the necklace!!! good god don’t let the usoc find this. LOL. They’ll start another round of crap like they did to Ravelry and the knitters/crocheters. Looks great though and I really like it! Featured this and links to you in our latest blog post, thanks for sharing what a fantastic idea! 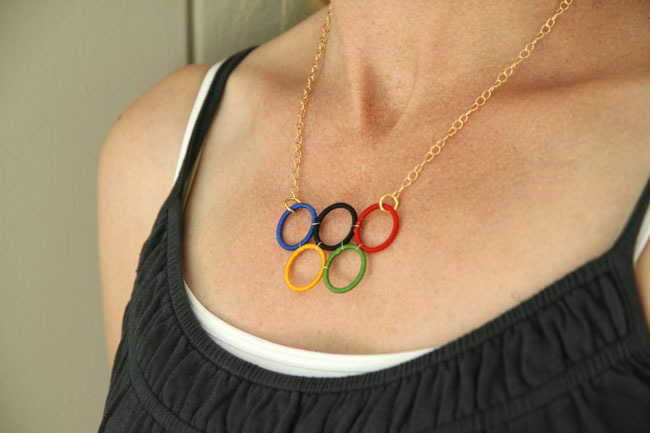 So beautiful…it is a lovely piece of jewelry – I featured it in a creative Olympic roundup! Feel free to submit them to the web site! Reposted at http://www.countryanvictoriantimes.com ….. thanks! Love your necklace, you did an amazing job!! Fantastic! It looks so good. Thanks for using the tutorial AND for sharing! Thank you for a terrific and simple idea. 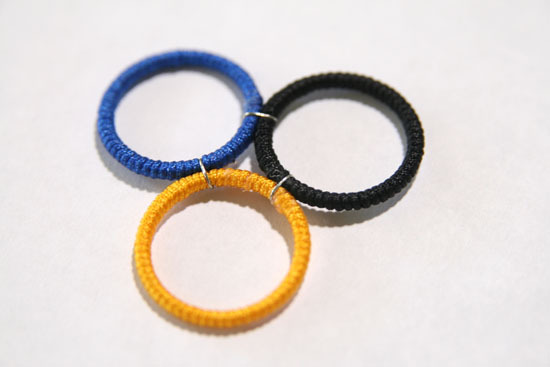 I made this to go with our Olympic themed VBS this week. I wore to our pep rally last night and it was a big hit!!! I was wondering if you can make 30 pieces of these cutest necklaces and ship them to me. 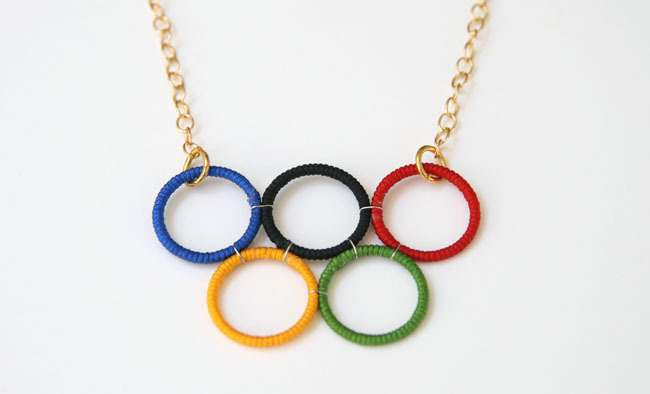 I am having an Olympic theme birthday party and would love to have these as give-away for the little girls. I really hope you can agree to sell me these for a reasonable price.